The American Dream is what has made America such a successful nation for hundreds of years. American President, Abraham Lincoln, once said, “You can have anything you want — if you want it badly enough. You can be anything you want to be, do anything you set out to accomplish if you hold to that desire with singleness of purpose.” The ideal of the American Dream from our Founding Fathers still stands. Everyone seeks to live the American Dream. Home ownership, private property and personal freedom are some of the most important aspects. The homes presented below, from Laura Barry of Barry Estates, Inc. and decorated by Susan Spath of Kern & Co., are the perfect example of the American Dream, which is still alive and well. 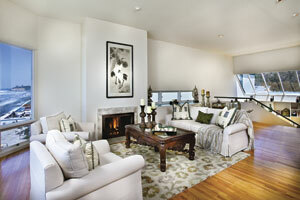 Laura Barry makes it clear that design is very important when selling a home. “You need every advantage in today’s market, it’s not just the price,” Barry says. Laura Barry was recently featured in the Wall Street Journal for being the highest ranked agent in San Diego County for sales volume sold from 1999-2009. For more information on these listings, please contact Laura at 858.756.2266 or laura@barryestates.com. The second home is brand new and privately nestled on over 1 acre in an exclusive area of Rancho Pacifica with ocean views. This elegant home is rich in detail yet conveys an easy going Southern California feel. With 6 oversized bedroom suites, theatre, billiards room with bar, walk-in wine cellar, grand library with secret work room and private entrance off charming courtyard, and a resort-style backyard, this home has every amenity in and out that one could desire. 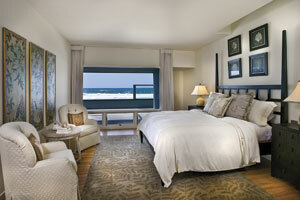 The first beautifully designed home is located on Ocean Front in Del Mar. A place where anyone would love to be living the American Dream! 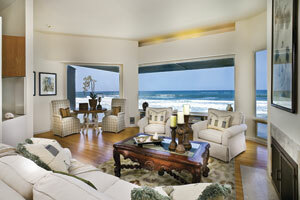 It is a true beach estate, completely gated. Mature trees line the property adding a romantic canopy of privacy rarely seen at the beach. The ideal and sought after location, the 19th block, is known to be the best block on the sand for so many reasons; all telephone wires are underground, the lots are the deepest available, and only steps to the quaint Del Mar Village. Being a home on the beach, “the quality of the furnishings and style of the furniture itself has to bring out the best in the home,” explains Barry. This stunning home is listed for $8,995,000 to $10,994,876. 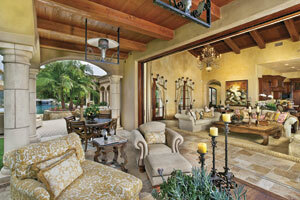 outdoors in or vice versa to create a larger and more open living environment,” states Spath. This ultimate custom estate is being offered at $6,949,000. “There has to be a level of emotional appeal to the buyer,” says Barry who trusts Spath’s wealth of experience in design. The American Dream is fed by the connection of hardwork and emotion, especially when it comes to buying a home. Strive for what you want…keep the American Dream alive.